Have questions? Need help? Please give us a call at (512) 288-9909! What’s So Special About Scallon Custom Pools? 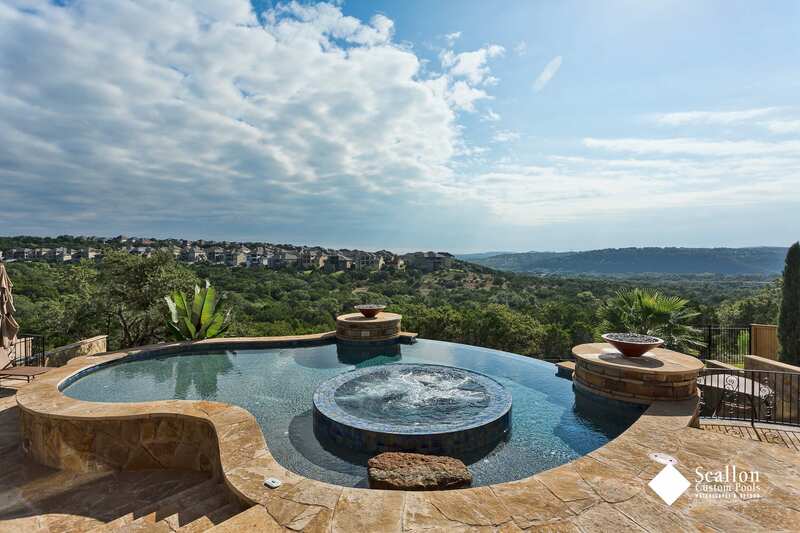 Over the past four decades, Tib Scallon has cultivated a reputation as one of the premier pool designers and builders in the Austin area. Raised in Austin, Tib takes pride in personally designing each and every pool project. With his in house team of artisans and craftsmen care and attention are shown to each project. Scallon Custom Pools is not like your average pool builder. We don’t carry a menu of pre-designed “cookie cutter” pool templates to slap into your yard. Our middle name is “Custom” for a reason. Every project is unique for us, just as it’s unique for you. You’ll find that we take the whole concept of “outdoor living” rather seriously. That’s why our portfolio is so varied. Because most people spend a lot more time “around their pool” than actually “in it”. So our goal is to make sure you can enjoy your new backyard creation anytime, day or night, 365 days a year, for decades to come. Over the course of your project, you’ll get to know a variety of our team members at Scallon Custom Pools. The Design Team will get your ideas down on paper, and ultimately finalize the details and the cost of the project. The Construction Team will bring the project to life, while keeping you informed every step of the way. Then the Service Team will take care of your pool, to make sure it stays crystal-clear forever. Complete Backyard Solutions – not just swimming pools; we design and manage the entire project start to finish, so you don’t have to worry about anything. High-End Custom Designs – no “cookie-cutter pools here. One look at our portfolio will show you how dramatic and creative our designs can be. Low-Maintenance, Energy-Efficient Construction – From oversized plumbing and filters to energy-efficient pumps, lights and heaters, a custom pool from Scallon Pools costs less to own and takes less time to maintain. In-House Craftsmen – rather than depend on transient laborers that come and go, Scallon Pools has a dedicated team of excavators, masons, plumbers and other craftsmen that learn and follow “the Scallon way. Service after the Sale – our Scallon Services team will ensure that your pool stays crystal-clear and inviting forever. Or, if you prefer, they’ll give you a short “pool school to show you how to maintain and operate your own pool. Award-Winning – Scallon’s work has been recognized by several industry organizations, including The APSP’s International Award of Excellence program. The APSP effectively replaced another well-known industry organization known as “National Pool and Spa Institute or NSPI in 2006.